MKSAP (R) 18 is specifically intended for physicians who provide personal, non-surgical care to adults, including general internists and primary care physicians, subspecialists who need to remain up-to-date in internal medicine, residents preparing for the Certification Exam in internal medicine, physicians preparing for the Maintenance of the Certification Exam in internal medicine, and medical educators. - Close gaps between actual care in your practice and preferred standards of care, based on best evidence. - Diagnose disease states that are less common and sometimes overlooked or confusing. - Improve management of comorbid conditions that can complicate patient care. - Determine when to refer patients for surgery or care by subspecialists. - Pass the ABIM Certification Examination and the ABIM Maintenance of Certification Examination. The new MKSAP (R) 18 Complete is an ill-inclusive learning system. Each program included is designed to provide you with the highest quality educational experience. There are more MCQs than ever before. 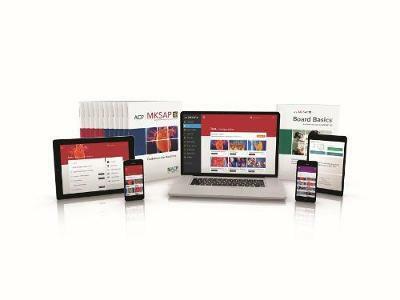 Classic MCQs in MKSAP (R) 18, image-based challenge questions in Virtual Dx and quick bytes provided by MKSAP (R) 18 digital flashcards combine to offer nearly 3,000 opportunities to test your knowledge.